In 2010, Alok Bhalla was interviewed by Jay Fidell, of ThinkTech Hawaii, for the series Asia in Review. With grace, feeling, and intelligence, Bhalla spoke on the topic of understanding politics through literature. An eminent scholar and member of the executive council of the Sahitya Akademi (Indian Institute of Advanced Study), he has authored, edited, or translated more than twenty books, including works by prominent Pakistani and Indian authors. 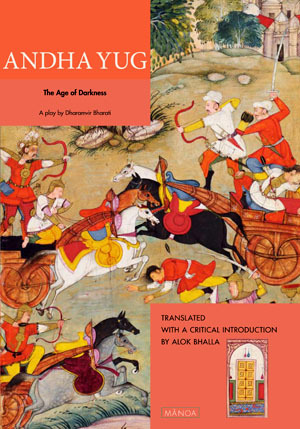 In summer 2010, MANOA published Bhalla’s English translation of the verse play Andha Yug, written in Hindi by renowned novelist, poet, and playwright Dharamvir Bharati. The translation was originally published in hardcover by Oxford University Press, New Delhi, in 2005, and has been difficult to obtain in North America. One of the most significant plays of post-Independence India, Bharati’s Andha Yug takes place on the last day of the Great Mahabharata War. The once-beautiful city of Hastinapur is burning, the battlefield beyond the walls is piled with corpses, and the few survivors huddle together in grief and rage, blaming the destruction on their adversaries, divine capriciousness—anyone or anything except their own moral choices. Andha Yug explores our capacity for moral action, reconciliation, and goodness in times of atrocity and reveals what happens when individuals succumb to the cruelty and cynicism of a blind, dispirited age. My decision to translate Dharamvir Bharati’s Andha Yug (1953) was the result of whimsy of course, but whimsy in the service of practical reason, and, given the present condition of the country, in the aid of political sanity too. In 2001, I spent a semester teaching a course on contemporary Indian theatre, with the help of English translations which were mostly bad. Strangely enough, Andha Yug, which was so literally translated as to seem like a long poem without any distinguishable theatrical or moral voices at all, and so thoughtlessly edited as to confuse any good logician, became the focus of rather disturbing discussions about the politics of revenge, the impotence of grief, the meaning of karuna (compassion), the failure of a morally responsible will to intervene in acts of violation, and the responsibility of the gods in leading us to moral dereliction and decay. Nearly every student pitied Gandhari, and there was unanimous condemnation of Krishna. Krishna made them uncomfortable. He should have behaved more like a dissembling politician pretending to fulfill our needs and wishes, rights and demands so as to win our votes, instead of acting like a god on behalf of morality and justice. Gandhari, they felt, was right in making Ashwatthama the invincible instrument of her revenge against the Pandavas. She had a greater moral claim to our sympathy than Krishna, whose omnipotence should have alerted him to his responsibilities and, thereby, helped the Pandavas and the Kauravas evade a catastrophic war by transforming them into moral visionaries. My students, I must insist, were not more ethically obtuse than any of us. After all, most of us demand that gods behave like highly paid karamcharis (lower-caste workers) or nongovernment officers, look after our social and physical hygiene, be alert to all our psychological anxieties, and protest on our behalf against caste, gender, or class wrongs, instead of bearing witness to the causes of grief, or marking out places of evil in our souls, and, sometimes, even singing praises for acts which are just so as to save that fragile thing called hope. Maybe, if we are more charitable, we think that God is no more than a junior judge in the lower court, where“arid disputes” are sorted out, instead of being the very form and idea of the Good, which finds its earthly incarnation in acts of knowledge, work, and love when they are performed with the full absorbedness of the soul. Talking to my students about the moral issues raised by Andha Yug, I recalled what the great Jewish philosopher Martin Buber, who had corresponded with Mahatma Gandhi about the ethics of nonviolent resistance against a ruthless enemy, had rightly said when he asserted that thinking about God was unavoidable in times of atrocities. Without invoking an absolute notion of the good or the just, all our truth-seeking impulses, especially when our very existence as a people is threatened, can only flounder and fall into nothingness.